What's going on lately? I was used to some hysterical psyop occuring at least twice weekly around the world - be it some lone gunman's shooting spree in a school or a rock concert, the regular "ISIS attack" by those horrid bearded men who hate our way of life - or assorted surreal & deadly disasters followed by fund raisers for the "victim's families". What's the Nutwork up to of late? Are they just too busy planning the rogue Venezuela putsch / take over? Kris Eyvindson wrote: They should have something go wrong at the space station, where it is questionable if they will survive for a couple weeks and it ends up crashing in the ocean after they rescue everyone with rockets. Some folks are apparently waking up to the pathetic antics of our "Daily Deceivers" - thank goodness. 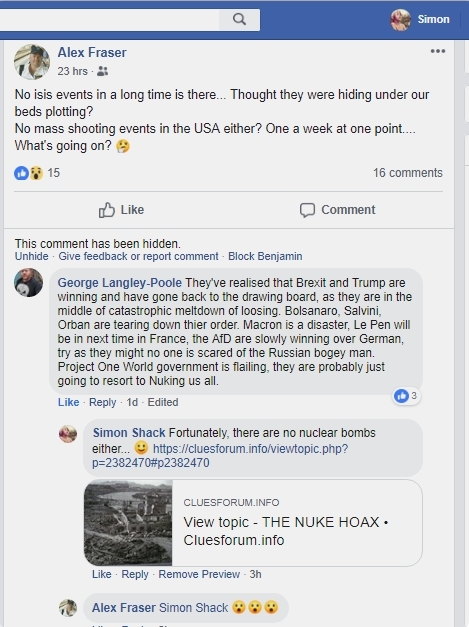 simonshack wrote: I can only hope the Nutwork's seemingly novel agenda won't leave us all without a job, here at Cluesforum! Tanti auguri from my better half and me. Or perhaps they've been busy producing this TV series that I stumbled upon yesterday flicking through the channels. But alas, Chris Hadfield is a white male I despise. Not for the made up reasons above however, but because he's a pitiful liar that lies to our children. How about a consumer information site that explains that what this prick will "teach" you for a hefty sum are complete and utter lies? warm hugs to you and to your sweet better half. 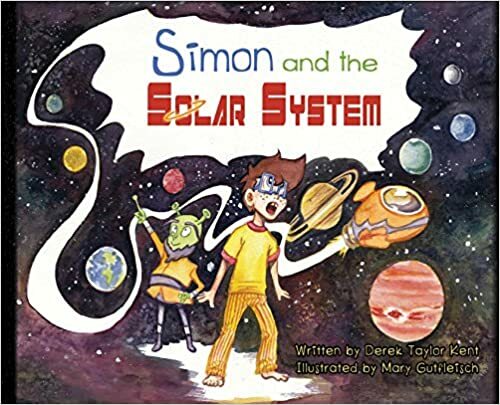 "In the end, Simon becomes an expert on all the planets and even the Sun, but his teacher has a surprise for him at the end!" My high school students have been inundated with reports on their social media sites about a serious rash of mass shootings over the last few months. The big kick-off started with the Thousand Oakes shooting in California where 13 people died on November 7, 2018. Then the rest of the lesser shootings trickled in up through January of this year. My students were pretty scared and a few of them even stayed home for a few days feeling that all hell had broke loose in these here United States. It seemed pretty clear that teenagers were the target audience. The Moral of the Story: Although you might not be the target audience and therefore are not aware of it there is always a psyop somewhere. Just saw this on the beeb. When we say one thing but do another, or hold inconsistent beliefs, psychologists call it cognitive dissonance. The term was developed by Leon Festinger, who first used it in 1957. The classic experiment in this field was published by Festinger and James Carlsmith in 1959. In it, they asked: “What happens to a person’s private opinion if he is forced to do or say something contrary to that opinion?” In their experiment, they had 71 men complete two tasks. First, the men were asked to put 12 round wooden spools into a tray, empty the tray and put the spools back in the tray, repeatedly, for half an hour. Then the participants were given a board containing 48 square wooden pegs. They were asked to turn each peg by a quarter turn clockwise, then another quarter turn, repeatedly, again for half an hour. While they did this, a researcher watched and wrote things down. These were intentionally boring tasks. Really, really boring. Although the participants thought it was their performance that was being measured, it was actually what came next that interested the researchers. After their two boring tasks, participants were taken back into the waiting room. They were told that the person sitting there was the next participant. For one-third of the participants, they simply sat down without anything else being mentioned. For the other two-thirds, however, the researcher asked whether they would lie to the next participant. They would even be paid for their lie. Half were told that they would be paid $1 for their lie, and the other half were told that they would be paid $20 for their lie (which in the 1950s was a lot). When they said yes, the researcher then handed them a piece of paper, and instructed them to make the points that were written on it: “It was very enjoyable”, “I had a lot of fun”, “I enjoyed myself”, “It was very interesting”, “It was intriguing”, “It was exciting”. What the researchers really wanted to know was what impact this lie, and the compensation for it, would have on participants’ rating of the task. They wondered whether participants would actually come to think they enjoyed the boring task, just because they told someone else it was fun. And how would being paid influence this? Who do you think rated the experiment as the most enjoyable? The control group, who had not been asked to lie, rated the task as boring and said that they would not do it again. The participants paid $20 also rated the task negatively. However, the participants paid $1 rated the experiment as far more enjoyable than the other two groups, and were more likely to say they would sign up to participate in similar experiments in the future. What happened? Being paid $1 was probably not seen by the participants as sufficient incentive to lie. Accordingly, they experienced cognitive dissonance. “Why did I say that it was enjoyable when it wasn’t? Surely not for a measly $1?” Since the participants could not go back and change their behaviour, or un-participate in the experiment, the option available to them was to change their belief – it must have actually been enjoyable.For the $20 condition this was not necessary, as they could explain their behaviour as the result of the hefty and easy financial incentive. This was the first of many experiments to show that we often bring our beliefs in line with our behaviour, and that money can change the way we do this. Where does certainty come from and how do you generate it? I would say that the simplest way to garner it is through repetition. Surely this is why the planet believes in democracy. It is the number one talking point on Western media political shows. Similarly, the BBC feature holocaust related items at least twice weekly, often more (either directly or indirectly). This highly repetitive pattern forming content helps to solidify certain notions in the minds. The BBC certainly didn't disappoint this morning (article linked below). 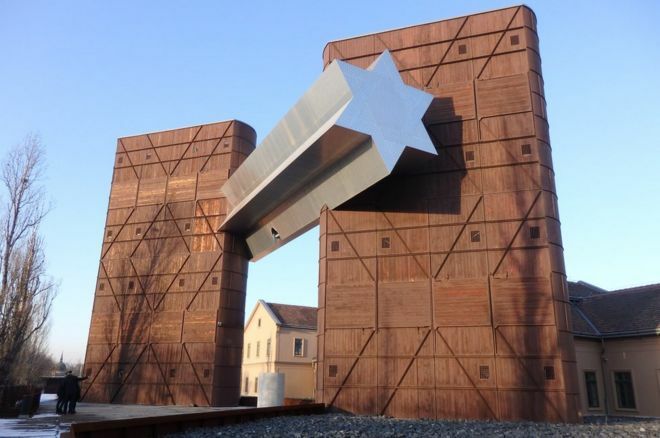 A reminder of the holocaust and the dangers of flying rolled into one, but with the bonus of tying in one of the seminal fiascos of our time with a somewhat vainglorious picture that is supposed to resemble...…. "cattle trucks"? pov603 » 2019 02 07, 08:18 GMT wrote: Just saw this on the beeb. Thank you TomR. It has been a long time since I watched that. I recommend (to our readers) checking out that portion of the video, since the concept is somewhat difficult to reduce to writing. To me, they key is understanding the lengths to which people will go (subconsciously) to resolve (or mitigate) the incongruity between the competing beliefs and/or behaviors. The site has been ready for more than three years but is still empty because of a certain ongoing political affair (between the government allegedly saving face of the policy of the wartime regime, and the Jewish organizations --- or the only organization here, a united one; „the holocaust was a worldly affair and not a religious one” says the government). And, moreover, it is situated kilometers away from the airport, something 8-10 kilometers or more, almost in the downtown. „Sorsok háza” -- (that is „the house of fates”) may be an allusion to the book „Fatelessness” for which its (Hungarian) now late writer received Nobel Prize in Literary in 2002. Many thanks for the link to the video, another interesting slant on things (will get round to watching completely in next few days). Is conscientious curiosity dead? Is critical thinking dead? Is emotional intelligence dead? Are we the post-modern soulless automatons of the New Dark Age? The question had been brewing for a few years among Hamilton and Altizer and their colleagues, notably Paul van Buren and Gabriel Vahanian. (Hamilton and Vahanian both died in 2012; van Buren in 1998.) In 1966, Altizer and Hamilton published a book of essays on the topic, Radical Theology and the Death of God, right around when the TIME story came out. Humans have been trying to find a way to dodge death for years. Ancient Greek alchemists tried to create a “philosopher’s stone” that would let people live forever, but humans have yet to beat death. However, Dr Pearson tells The Sun that there are a number of different ways we could live forever — as long as you can make it to the year 2050. If you kick the bucket before then, you might be part of the last generation of humans to die of old age.